Album artwork is important to me. I consider it part of the entire album experience, and in the digital age, I believe now more than ever that the aesthetics and visuals associated with an album are extremely important. For my fourth album, a 4-song EP, I chose songs having to do with the wretchedness of love. 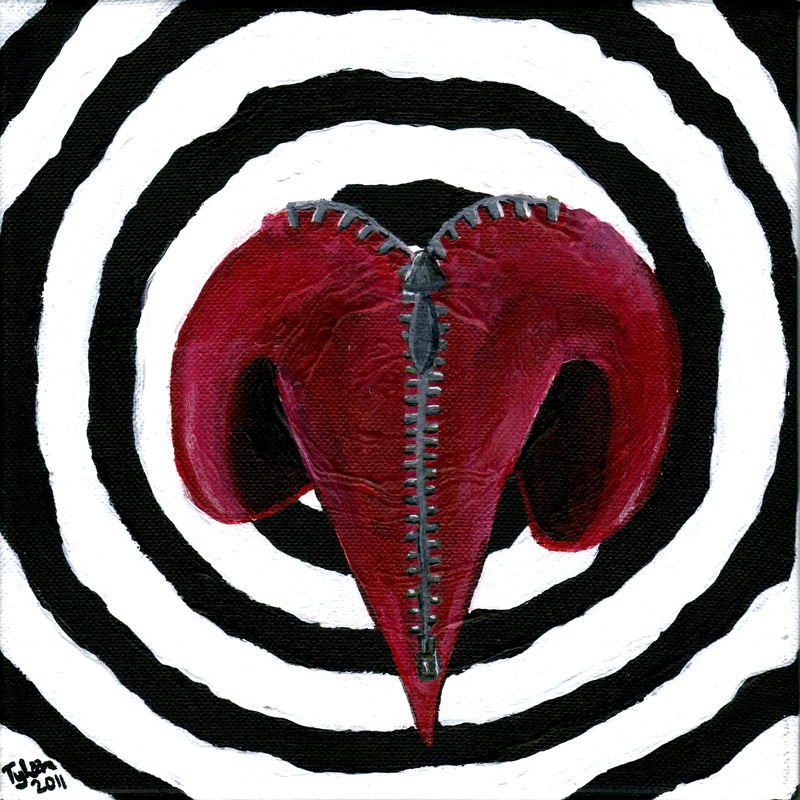 I decided that instead of conventional album artwork with photography of or by myself, I would do acrylic-on-canvas paintings depicting four hearts in various stages of misery, rot and decay. The first song on the album is “Love Always Dies.” I did a highly textured painting achieved largely by using matchsticks instead of paintbrushes. The left half is a typical, pristine heart that the likes of Lisa Frank would conjure up. The right of the painting shows a grotesque whithering away, the flesh melting into a puddle showing its own idealised reflection. A reflection which is considerably different from the reality. “The Dark and the Blue and the Grey” is the second song on the EP. Although it appears to be the most simplistic of the paintings, it was actually the most challenging for me. 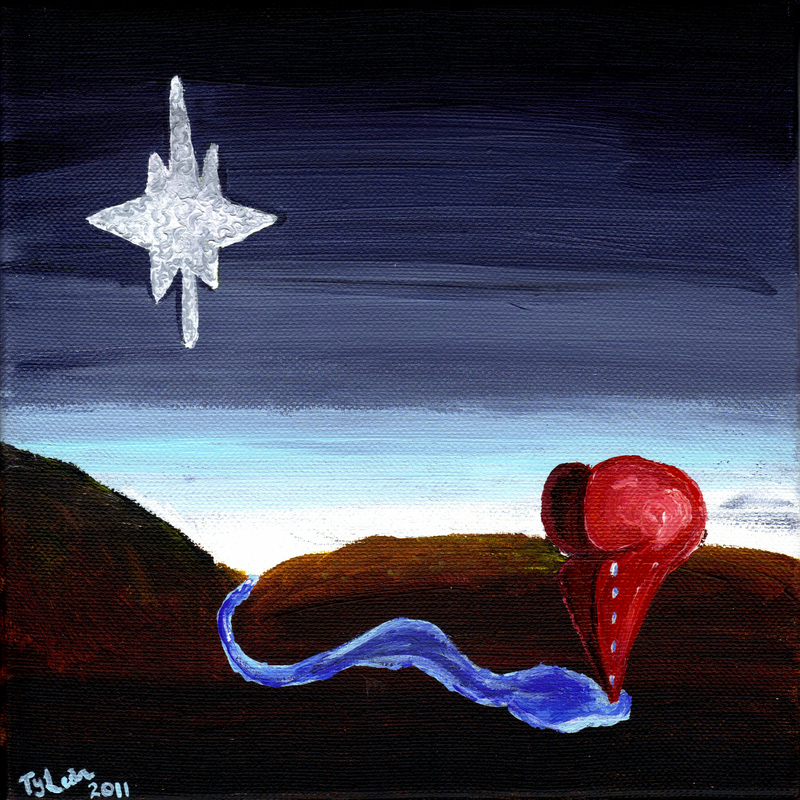 The painting shows a heart stood in a desert, bent over and crying a river. Having no training in art what-so-ever, I found portraying a heart bent over – whilst still be recognisable as a heart – to be quite difficult. The large white star was also painted using matchsticks to achieve a textured look. “Big Hearts” is a more Kate Bush type of track with a big somewhat cheery sound (given the context of my brand of misery). The lyrics, however, are slightly political dealing with the “givers and takers” of life. 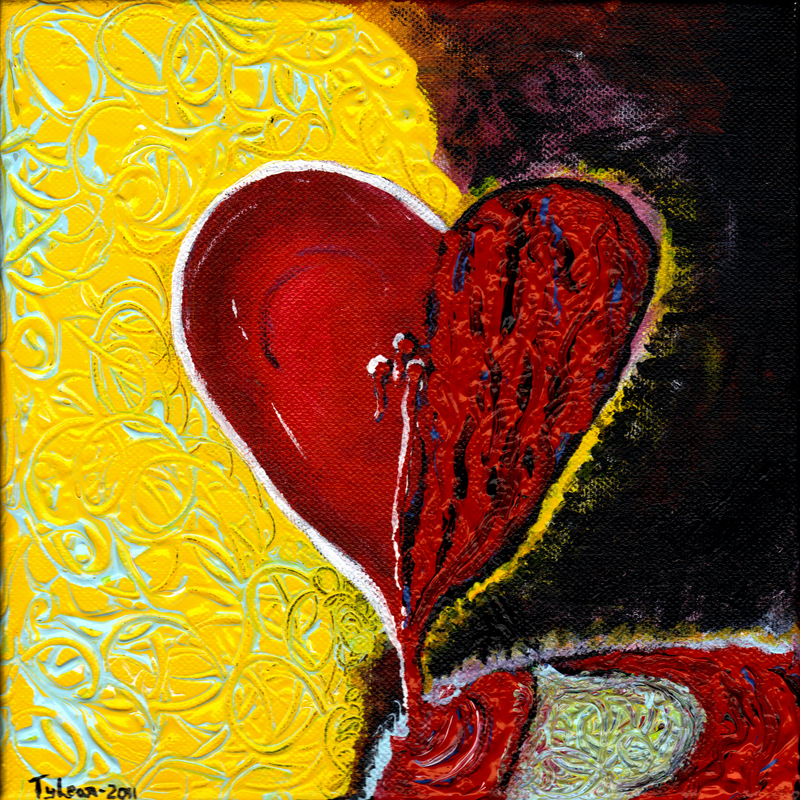 I decided that this heart, rather than being broken or damaged by another entity, would be intentionally unzipping itself in two. For me, I feel the song has a slightly retro feel to it, and being a lover of music from the 1960’s, I went with a trippy black and white background. In my opinion, the best song on the album is “Amputation of a Heart,” which is also my favourite of the five paintings. 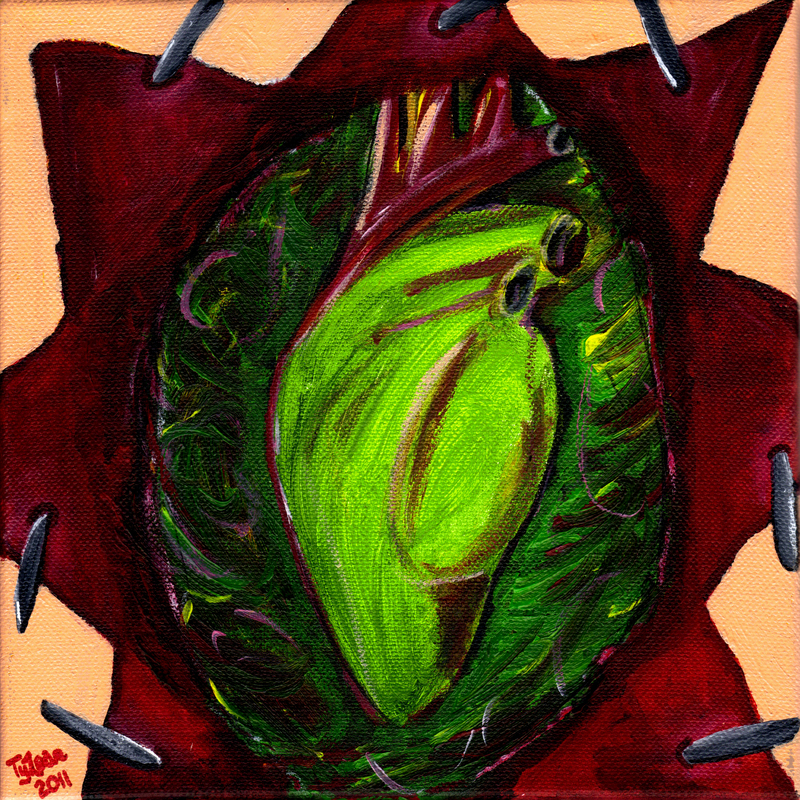 In keeping in line with the lyrics, this heart was literally a green, gangrenous heart exposed through an open chest cavity and in the process of amputation. I wasn’t finished with my paintings, however! I still needed one for the album cover, something to tie all of the paintings together. I envisioned a witch doctor like laboratory and a jar of formaldehyde with a heart inside…. hence the album title. The album title and the miniature heart paintings floating inside of the jar were added with Photoshop later. 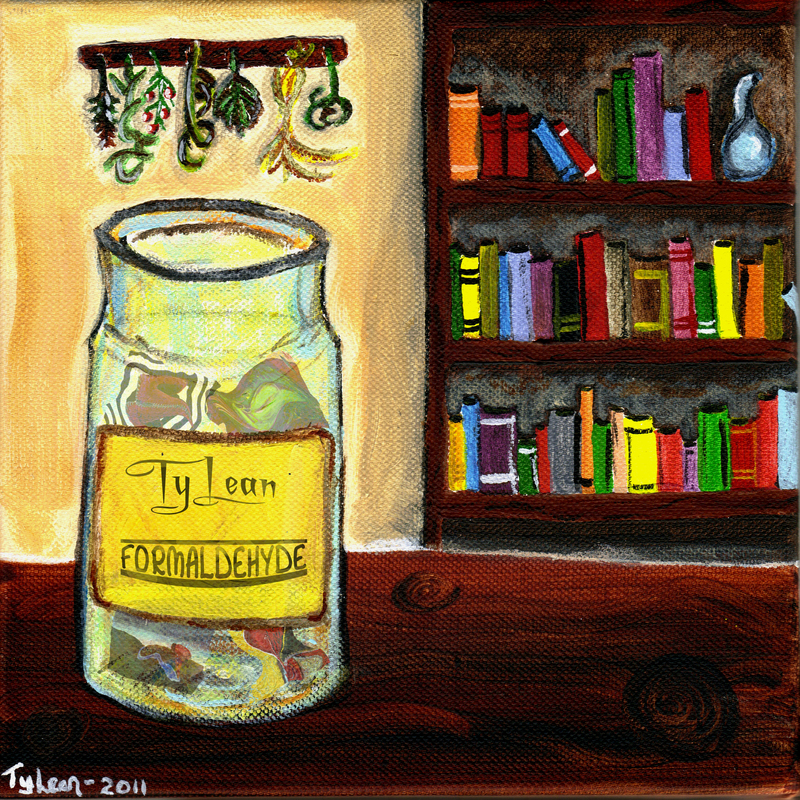 Anyone who orders “Formaldehyde” directly through me receives high resolution jpeg files of the four Formaldehyde paintings plus the album cover with full permission to print the images for personal use or decoration. You can get a free download that includes a Formaldehyde track here.